Chance was gone; he’d sacrificed himself so Shannon and I could escape Sheol. We’d raised him on Shan’s spirit radio, which meant his soul wasn’t wholly destroyed by the demon gate…. Once Corine Solomon only had the touch—the ability to read an object’s past by handling it. Then she inherited her mother’s magick, and that ended up being a hell of a burden. But if Corine can wrestle a demon queen and win, she can bring back her lover Chance after he’s made the ultimate sacrifice. Can’t she? All Corine knows is that she can’t leave Chance behind if there’s anything she can do about it. But the clock is ticking—and she still has to deal with debt-collecting demons and a maniacal archangel who’s running a recruitment drive. The stakes have never been so high…and this time it’s truly Corine’s last chance to save the love of her life. 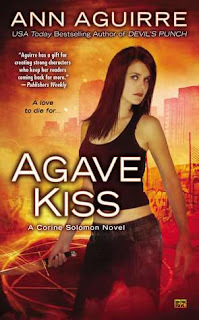 Agave Kiss by Ann Aguirre is the end of a series, and this final book puts the heroine, Corine Solomon, a woman with magickal talents, and who can tell where an object’s been by handling it, in another tight spot. As the 5th book in the series, readers are aware of how often Corine has to face up to the supernatural. Only this time, she’s not dealing with a demon queen. Now, Chance, the man she loves is the person in trouble, and on top of that, there’s an archangel out to fill his recruitment quota, and a bunch of demons who think that Corine owes them something. And this time, if Corine doesn’t figure out a way to win, Chance is the one who will pay for her mistake. Corine hasn’t had an easy time of it along the course of this series, and that’s a very good thing, for drama, and story, as well as the character overall. In order to get to the conclusion of this story, she has had to grow as a character, and so the ending of Agave Kiss feels earned. There are other obstacles to overcome in this book, but primarily, Corine has to handle how best to get Chance back, and survive. Other characters make appearances, and the theme of the series, and in particular this book, is sacrifice, and each of them has had to give something up - the difference is the way in which they have handled it. As the story ramps up, and all the pieces are set up for the finish, Corine can rely on familiar faces, such as Church, Shannon, and Eva. Of them all, Shan has undergone some fairly profound changes in the series, and it’s wonderful to see her blossom and step up when she’s needed. Kel is also a major part of the story, and he’s not the only one who will have things revealed that readers have been wondering about. Holding back on spoilers is a good thing, fans will be surprised, and in some cases, shocked about what’s revealed. Without revealing the plot or its twists, it’s enough to say that Corine has a lot to overcome, but at least she’s going to do it with her friends beside her, and if she has anything to do with it, Chance isn’t going to be another lost loved one.